He balances perfectly while holding 0, 1 or 2 standard soda or beer cans or bottles. An amazing display and serving decor! LOVE IT!! 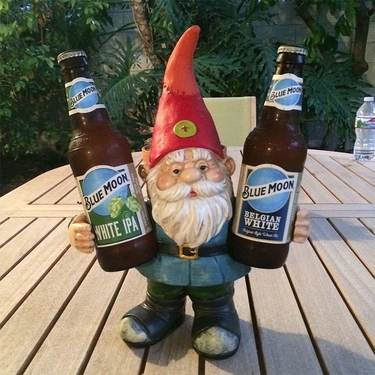 So for that next special occasion or just a colorful and fun addition to your happy hour, Drinking Buddy Gnome is always ready and willing to share a drink with you and your friends. So eat, drink, and be merry. And don't forget to toast. Cheers! Size: 10" x 5" x 13"H, Resin.